Alright it may not have been poisoning, but it did a fair amount of damage anyway. Besides if I call it poisoning I can pretend it was their fault and not the fault of my body. I mean who develops an allergy to mango at 28? Maybe it was a specific type of mango or just the skin. I don't know that much about them. Though I did found out the skin of a mango is in the same plant family as poison ivy. I'd done a good job in life up to this point staying away from poison ivy. Must have been the negative connotations that go with the word "poison." So in a way, yes, I was hit hard by poison mango. The urge to have mango in the first place, came after having directed a segment on the midday news in which a nutritionist encouraged eating fruits, specifically the now dreaded mango. It had been at least a couple of years since I'd last had mango, but the sweet taste was instantly recalled the second I saw the nutritionist slice into one. Or at least I assume that's how these cravings work. One way or another, it made me check the fruit at the grocery store. To my surprise the store was offering a buy 3 for $3 sale on mango! It seems like a premeditated crime now that I think about it. I didn't know at the time, so I bought three mangos. 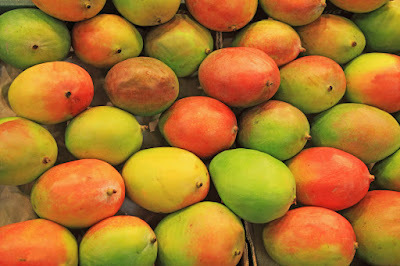 Now, I'd had mango before and liked it, but I'd never picked one or handled and cut one before. As I was cutting it, I was sure I was doing it wrong, but what I could eat tasted good so I didn't care. What I couldn't cut, I could at least eat off the peel. "Waste not, want not. Don't let it go to waste!" If anyone ever tells me these things again, I'll point them to this story or ask them how they feel about gluttony. The actual poison in mango skin is something called "urushiol." It's an oily allergen found in poison ivy, poison oak, poison sunmac... and mangos? If you're thinking one of these is not like the others I wouldn't call you crazy. Nevertheless whatever oil I didn't rub directly on my lips and cheeks from holding the thing up to my mouth got on my hands, which then got wherever else I touched. Apparently that means I had an itch approximately all over my face and at least two spots on my arm. Though some of this could have been from scratching the affected area and getting that oil back onto my hands and then scratching elsewhere. It started a couple of days after consumption. At first it was just my lips. I couldn't figure out why my lips felt like I'd been traipsing through the desert without chapstick for days. But once my cheek started to redden and swell with little red itchy bumps I knew something was up. I immediately traced it back to the mango, because it was the only thing out of the ordinary I had eaten. So as we do these days I consulted my friend and doctor Google, and found several videos of people explaining what they call, "mango mouth." Though they claimed the redness and itch would stop spreading after a day or two and go away a couple of days after that. So I medicated myself with anti-itch cream and proceeded to wait it out. Having something out of the ordinary going on with your face while in public is a peculiar thing. At work or hanging out with friends I had two options. I could either hope no one noticed and shy away from looking people in the face while keeping my distance, or I could try the more direct approach and just put it out there. I tried both. The second option got me the response, "is that why you're breaking out?" Apparently everyone noticed. Option one was no longer an option. By the end of the week the itch was getting worse and the redness and swelling had spread from my lips, chin and a bit on my cheeks all the way up the side of my face. I suspected the possibility of the oil from the bumps getting on my pillow and spreading to other parts of my face while I slept. This was clearly a clever, resourceful, and relentless poisoning. So I washed my pillow and forced myself to sleep in a position I wasn't accustomed to in order to try to keep my face as much off my pillow as possible to prevent further spreading. As far as I can tell that didn't help, and I didn't sleep well either. If the less than comfortable position wasn't bad enough, I had to wake up to apply more anti-itch cream every once in a while. My family told me to I should go to the doctor, because... what were the words? ... I think it was something to the extent of, "your face it messed up." But I had already looked up the problem, and I was sure I'd seen the worst of it. I was wrong. The worst part was when it advanced to my ears. I can't explain the agony of relentlessly itchy ears. No amount of anti-itch cream would do. The more I scratched, the more red and swollen they got and the more itchy they got. My eyes were next. Well not exactly my eyes, my eye lids, and all the skin around my eyes. Couldn't stop scratching there either. By the following morning (Sunday) my eyes were swelling and even my nose had become covered in the red itchiness. I realized that this was getting out of hand and that I didn't want to show up to work looking like this the next day. So I reluctantly forced myself to go to Urgent Care. It was Sunday morning, how busy could they be? Well busy enough that I had to wait in line and stand there while people in the waiting room looked at me like I was some misshapen freak. I mean I did look like a misshapen freak. My eyes were swelling, so I looked dead tired. But it turns out if you stand in line with big red bags under my eyes, and one ear that's significantly larger than the other the nurse behind the counter will call another nurse to get you out of line and take you back to be seen. One the one hand I was grateful, on the other hand I knew what this meant about my looks. Not good. When I told them it was mango that had done this to me, they seemed surprised, and maybe a little relieved that I wasn't dying. But then again, not dying meant I had to go back to the waiting room after taking a number (ok that's not exactly how it works, but you get the idea). Never have I had a more self conscious waiting room experience. Whatever ailments the rest of the people where in for, they weren't as noticeable as mine. But the young kid sitting a couple of chairs down didn't seem to notice. That's one of the ever redeeming qualities of kids. They can be friends with anyone. Superficial things don't seem to bother them much. But thankfully I was called in to the doctor after a fairly short wait. The doctor assured me that it was indeed an allergic reaction, then prescribed me Prednisone and told me to take Benadryl and use Calamine lotion. I did all the things. But Benadryl tends to make you sleepy, so I spent the next couple of days in a bizarre state. When I was awake, I was out of it and it was all I could do to not scratch. The rest of the time I slept. For the first time in I don't know how long, I took some time off work. It wasn't how I wanted the time off, but I figured the guys at work could handle things for a couple of days considering I pretty much never take time off. I suppose I can't blame anyone but myself for being allergic to mango, but you'd think the grocery store would have a sign or something. "Be careful this fruit is guarded by poison ivy. Touch at your own risk!" I was back at the grocery store just the other day and my curiosity made me check for a sign. Perhaps I just missed it. There wasn't one. I gave the fruit stand a wide berth and returned home to my anti-itch creams.